for replacing traditional high-pressure sodium and metal halide sources in enclosed lighting fixtures. With the removeable lamp base, you can install the light to the fixture as a Hanging light or Post Top. They feature excellent optics for Increased Visibility, and Low Power Consumption. With Lamp Life of up to 50,000 hours, they significantly reduce Energy Consumption and Re-lamping Costs. It can be with clear or frosted cover that is ideal for multiple purposes that require metal halide or HID lighting. This LED corn bulb is the perfect retrofit in a variety of situations, when you are seeking an LED HID retrofit lamp for post tops or replacement for energy-draining warehouse lights. ● Make sure to remove or bypass the ballast in the fixtures before install the lamps. 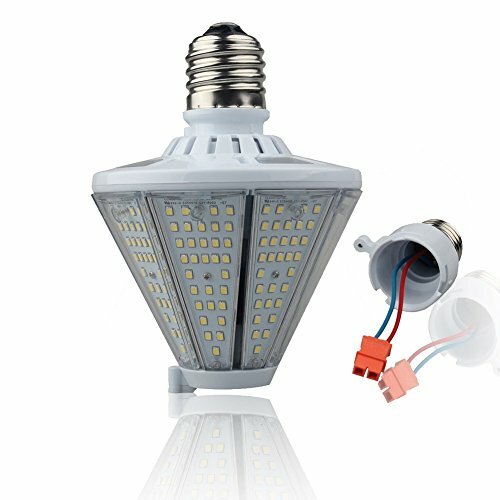 REMOVEABLE LAMP BASE: It is Conical LED bulb, you can install the lamp base on the flat base of cone bulb as a hanging light, also install the lamp base on the vertex of cone bulb, ensure all light down to the ground in different fixtures, such as post top,high bay,canopy,wall lantern,shop light,garage light,post pole and so on. DOUBLE LAMP HOLDER: This led corn light bulb come with a mogul E39 and a medium E26 Base,and they are interchangeable,so the cone led bulb can be used in the mogul E39 and medium E26 lighting fixtures,don't warry about the lamp Base size. HIGH LUMEN AND ENERGY SAVING: The Led corn bulb generates a stunning 6500 lumen output of 5000K daylight color at 130lm/W , designed to replace up to 175W Metal Halide/HPS bulb. Cut down your electricity bill by 70%. HIGH QUALITY: The post top led bulb is unique construction design with excellent heat management and High quality aluminum Heat Sink ensure long life performance up to 50,000 hours. (23 years based on 6hours/day). IP65 Wet location-rated design, waterproof, dust-proof, mosquito proof. Buying with Confidence: Our LED corn light bulbs have been certified by UL. During rigorous testing prior to bringing the best product to our customers. Naturally, we stand by our words with our 5 year unlimited warranty. If anything should happen, we've got you covered!